Ticks are nasty little creatures which are both hard and soft. 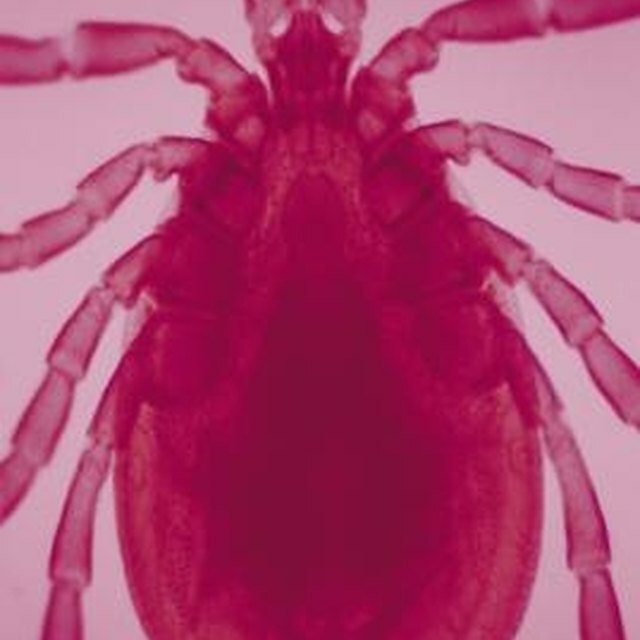 Aside from being a nuisance, they carry the potential of diseases, such as Lyme disease. Ticks are often found in doors, as pets wander in yards and woods, transporting the parasites into the home. Getting rid of ticks and preventing their arrival is fairly simple. Vacuum your home thoroughly. Under carpets, beds, pillow on the couch, leave nothing unturned. When finished vacuuming, remove vacuum cleaner bag and place in a sealed bag. Place the sealed bag in the garbage. Make a solution of Clorox and water and spray in crevices and cracks on walls and floors. Ticks like to hide in dark places, and cracks and crevices are ideal. Wearing gloves, wait for the ticks to appear and swipe them up with a tissue. Dispose of the ticks by flushing down the toilet. Gather all bedding and clothing, including washable children's and pet toys. Wash these items in your washing machine with hot water and using a regular cycle. Use a concentrated insecticide that contains Esfenvalerate, which is effective in getting rid of ticks. Mix 1 to 2 ounces of the concentrate with one gallon of water while wearing rubber gloves. Using a spray bottle, apply the mixture to carpets, furniture and floors. Do not allow anyone to touch treated surfaces until they are dry, especially children. Set off insect foggers. You should set off one fogger per room, only. Do not set a fogger off in small spaces that are enclosed, such as cabinets, closets, etc.. If the room is smaller than 5 x 5, do not use a fogger in the room. Turn off pilot lights, turn off gas valves, any open flames or running electrical appliances, such as refrigerators and thermostats, and all ignition sources. Follow the directions on the fogger packaging carefully. Remove exposed food, all dishes and utensils, clear surfaces and all food-handling equipment. Vacum rugs, upholstered furniture, baseboards, and under furniture. Remove vacum cleaner back and place in a sealed bag and dispose in the trash can. At arm's length with the nozzle pointing away from your face and eyes, push down on the can's finger pad until it locks. The fogger should start into action. Positon the canister in an upright position and set on a piece of furniture, such as a table up to thirty incles high, in the center of the room. Place newspaper on the table, under the canister. If you have a large yard you may considering adding Guinea hens to the yard. These hens are excellent tick hunters and will help to keep the population of ticks down, thus being carried indoors. Check your animals when they come in from outdoors. Always protect yourself by wearing plastic gloves. If they are carrying ticks, remove the tick. Dispose the tick by wrapping it in tissue and flushing it down the toilet. Keep your pets from wandering in woods and in the yard. Dogs and cats are the most frequent carriers of the insect and like to locate in the same areas as the insects prey. If you or a family member is bitten by a tick, identify the tick and if the tick is a species which carries disease, schedule an appointment with your doctor.